One of our neighbours is a keen fisherman and gave us this huge trout, it was about 15 inches long and pretty substantial, not like the one's you buy that feed only one person. I meant to take a picture of it before I started, but forgot, sorry! 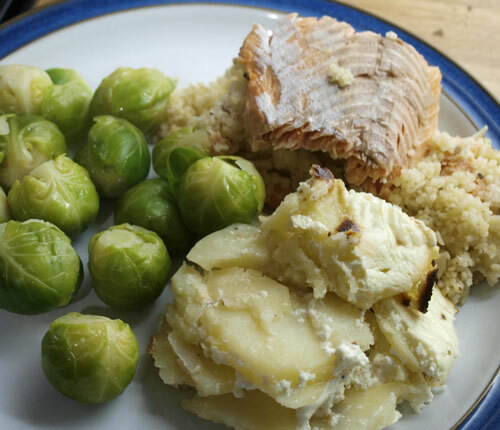 The recipe I used comes from BBC Good Food website, Stuffed Baked Trout click through to get the recipe, it is very simple and uses things that most of us have in the larder. Many other recipes that I saw used fennel which would have been nice, but I didn't have any! I served the trout with this variation on potatoes Daupinois, I sliced the potatoes thinly and seasoned between the layers with salt & freshly ground black pepper. 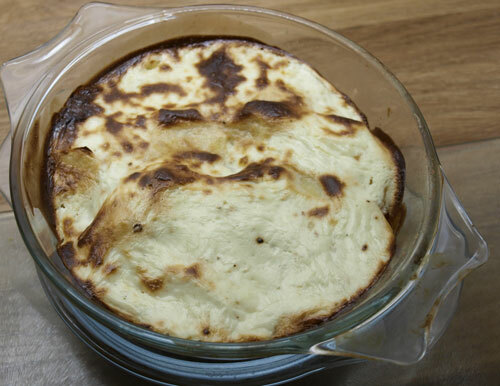 Then I mixed 150g of left over Philadelphia Cream Cheese with enough milk to give a creamy consistency and poured this over the potatoes, then baked in the oven until the potatoes were cooked and the top of the dish was golden brown. There was quite a lot of couscous and we could probably have managed without the potatoes, but the trout was delicious and moist and the creamy potatoes and lightly cooked brussel sprouts went very well with the finished dish. Wish I could get my hands on some beautiful trout like that! You certainly did it justice. 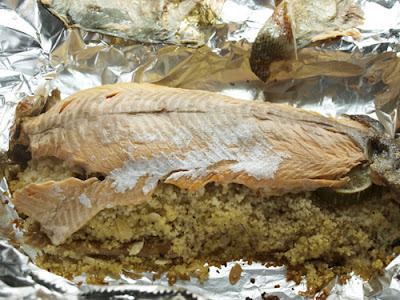 Your trout looks fantastic. One of my favourite fishes actually and we cook it quite often though tend to do it the same way each time. Will try this next time we have one!